The Graduate Recruitment Initiative Team (GRIT), which was initiated as a grassroots student organization, is now in the process of formalizing with the support of administrators and faculty. GRIT’s main goal is enhancing diversity and inclusion across BSD graduate programs. To achieve this goal, the team focuses on three central components: recruitment, retention, and sustainability. Recruitment spans all parts of the admissions proceedings: pre-admissions, the invitation decisions, and the interview weekend. During the pre-admissions stage, GRIT members travel to conferences that focus on URM scientists to recruit new students. Graduate students build relationships with potential recruits, and connect them with faculty members from different programs. At the institution, GRIT works with faculty to correct implicit bias, and host pre-interview video chats with prospective minority recruits. During the invitation decision stage, GRIT plays an advisory role in selecting candidates for interviews. During the interview weekend, GRIT hosts diversity panels to talk about the university climate, the culture, and to discuss in an unfiltered setting (no faculty!) what graduate education at UChicago is like. Retention focuses on community building and maximizing each minority graduate student’s potential through shared resources. By being a part of the GRIT community, students build valuable relationships with faculty members, sharpening their leadership qualities. GRIT members also share a sense of community around accomplishing the GRIT goal—enhancing diversity and inclusion in the graduate program. 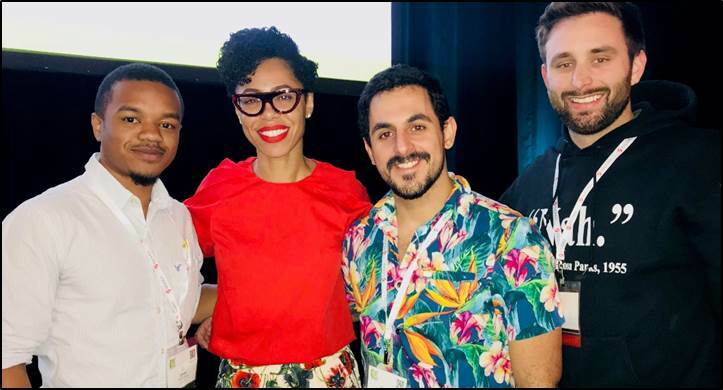 Traveling to URM conferences and advocating on the behalf of minority students brings members closer together. GRIT members have a proven track record for success in their respective programs, having achieved prestigious fellowships and travel awards. GRIT members are encouraged to serve as mentors for other members and share their resources and knowledge on awards and fellowships. GRIT strives to cultivate an even more skilled and competitive generation of minority scientists. Sustainability focuses on maintaining the viability of this community-driven system of recruitment/retention as GRIT student leaders move into the later years of their PhD thesis work. GRIT achieves sustainability by training incoming minority graduate students essential leadership skills and providing resources that will promote the advancement of their careers. The term limit for student leaders is one year. Term limits serve to promote healthy turnover of team leadership, maximize the training of other GRIT members, and ensure the views of incoming minority graduate students are represented. You can contact the team at UCGRIT@gmail.com or visit them at https://voices.uchicago.edu/grit/.